Napoleon quality and performance without the bells and whistles that add dollars to the price tag. The pedestal base conceals the optional outside air kit. A single lever burn control regulates the primary and secondary air for a clean burn. An air wash keeps the cast-iron door's glass clean for an enjoyable view of the flames. 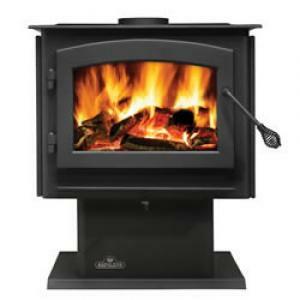 Cool air is circulated around the firebox with an optional blower, and accessories for even more heat output. The 1450 uses an economical 6" flue for ease of installation and no catalytic combustor that could bring maintenance headaches down the road. Heats up to 2000sq. ft. Mobile home approved.